Surrey Quays 1988 by Carol Kenna & Steve Lobb. Acrylic Paint. This mural celebrates the dockland past of the area! Located in Surrey Quays Shopping centre are two wonderful 1990’s murals; it’s not often that we get to find 20 year old murals in such good condition. One is situated within the right hand entrance and the other is in the left hand entrance. 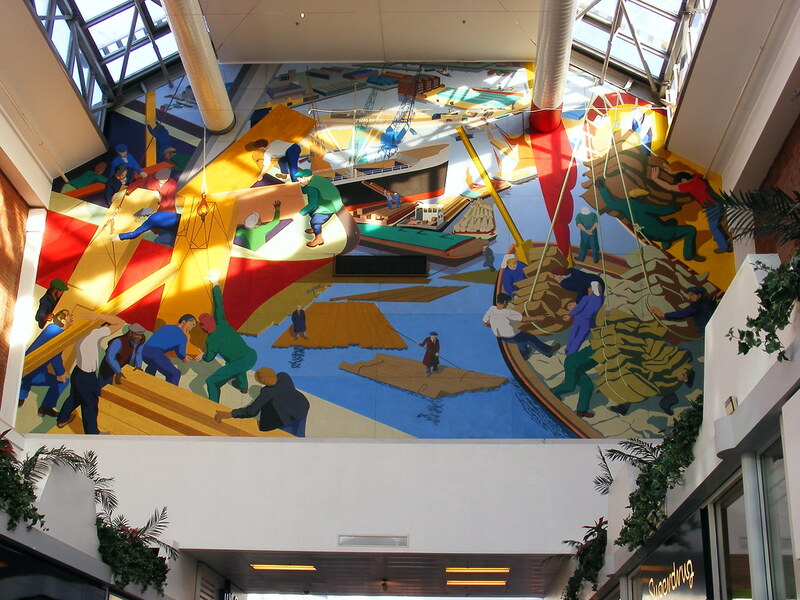 The Surrey Docks mural, which examines the history of the area was one of two commissioned by Tesco, who developed the shopping centre and have a large store within the complex. Greenwich Mural Workshop created a number of designs which referenced the history of the area; these were then shown to a panel of Tesco developers and marketing staff who chose the designs we see today. The Surrey Docks mural, accessed by the left entrance, depicts the wood wharves in the area. From the beginning 19th century, two of the main products held at these docks were the Scandinavian and Baltic timbers. At one point Surrey Docks had six timber ponds with expansion of the area continuing into the 20th Century. However World War 2 bought the most extensive bomb damage to any dock system in Britain. Amazingly this wasn’t what led to the end of the docks. The local area picked itself back up and was involved in the manufacture of the concrete caissons for the Mulberry Harbours (named after Mulberry Quay in the docks) used in the D-Day landings. The system of shipping goods changed and it became easier for products to be moved around in containers which need to be placed on bigger ships. The docks weren’t capable of handling this so by 1969 they were closed. The surrounding areas are littered with signs of the old dock system from buildings through to canal bridges and pathways. The murals record some of these stories. Stephen Lobb and Carol Kenna of Greenwich Mural workshop drew up the design. Three mural artists, Brian Barnes, Kim Bennet and Karen Gregory helped with the painting and were assisted by Chris Cardale, Ben Lobb and Bathan Lobb. The murals were painted in acrylic paint onto masterclad panels. Each panel is 8m by 13.5 m. They were installed in 1988. As they are indoors and well protected from the elements, there is little sign of damage and they look very good over 20 years later. It is becoming a luxury to see these pieces in good condition so please go and see for yourself. This mural is located indoors and suspended out of arms reach. The shopping centre is locked at night so it’s unlikely that anyone can do damage under cover of night. There is no evidence of fading or water damage. From the exit of Surrey Quays station, you will see to your right a shopping centre. Cross the road outside of the station heading towards this building. You will see two entrances. Head to the entrance on the far left. This will take you to the mural.